Millennials are not only the largest generation in U.S. history, they will also receive the greatest transfer of inherited wealth ever. It’s also been observed that Millennials are changing how businesses operate through their unique preferences and behaviors surrounding spending, lifestyle, and finance. Because of this, Millennials are poised to transform nearly every facet of the U.S. and global economy, and the Finance industry is about to experience tremendous change as it works to address the needs and preferences of this different customer. Depending on their age, millennials have witnessed up to three major crashes in the stock market — 1987, 2001, 2008 — and don’t inherently trust public markets with their investment dollars. According to a 2015 survey by Capital One ShareBuilder, 93% of millennials stated either a lack of trust or lack of knowledge about the stock market as primary reasons for being leery of the public markets. A recent survey by BankRate, presented in more detail below, concluded that only 33% of millennials own stock, compared to the national average of 43%, and a rate of 51% for Generation X. 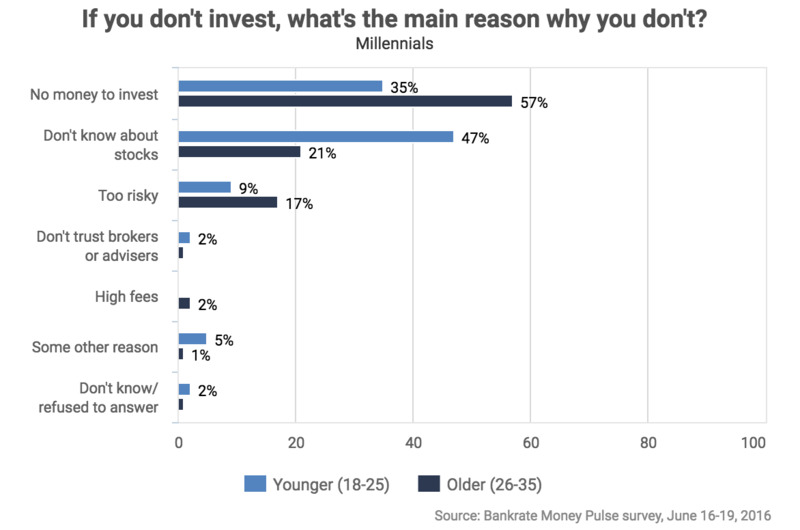 The number one reason that millennials aren’t investing? They don’t have the money, younger millennials especially. Between the historically high student debt burdens they are carrying, and the tough job environment many have faced since the Great Recession, their cash reserves are low. And what they manage to save, they are stashing away in saving accounts — millennials save a greater percent of their paycheck than any other age group in America. In some ways, the millennial mindset is more similar to those who survived the Great Depression than any other. That said, in the era of the “shared economy,” millennials can and will fine-tune their spending to become the most capital-efficient generation of all time. As one example, let’s look at car ownership. According to research from Goldman Sachs, millennials have a historically low interest in buying a car, with only 15% saying owning a car is extremely important , compared to 2x-3x that number for older generations. 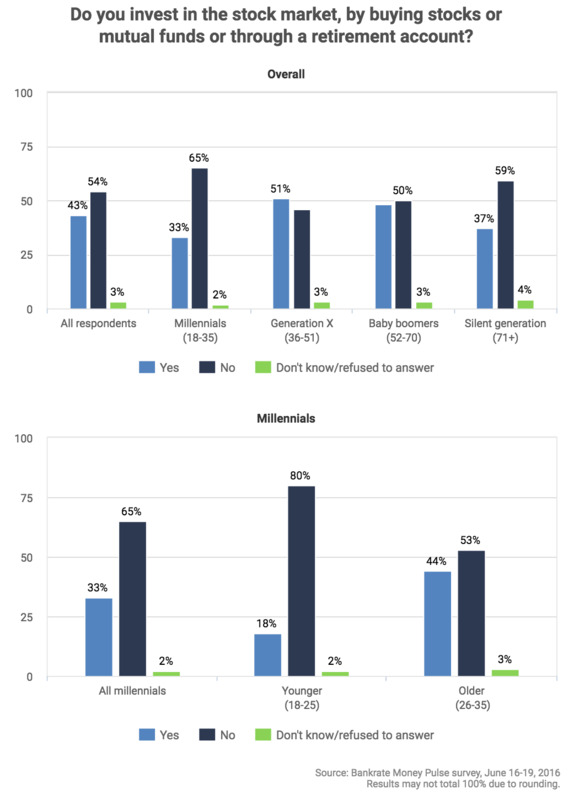 Millennials support the expansion of public transit, are concerned about the environment, are accustomed to Uber and Lyft, and don’t see the point in paying for a car that sits idle most of the time, much less the universe of costs — interest payments, car insurance, maintenance, parking costs, etc. — that come with it. As the data above suggests, as millennials age their wealth will grow, and they will naturally become investors as well. And beyond the sheer amount of wealth they will be controlling, they will be markedly different in their investing activities than the generations that preceded them. For one thing, they appear to be remarkably savvy. While Baby Boomers and Gen X’ers were selling during the two most recent stock market dives — Brexit and the oil price crash in February — Millennials were buying at a ratio of more than two-to-one . Their technological savvy will also force online brokers to differentiate themselves through user experience and e-features rather than its financial products — mutual funds, ETFs, etc. — which millennials rightly view as pretty much the same. And technology has lowered switching costs, so maintaining trust through transparency and frequent communication is paramount. This applies to wealth managers as well as the management teams that millennials invest in. But a more radical change is also likely, and that is the shift from “traditional investments” to alternative investments such as private equity and angel or venture capital. This generation has grown up in an era where startups are the norm, and entrepreneurs are lionized as agents of innovation while CEOs of Fortune 500 companies are looked upon more skeptically than ever. To them, crowdfunding and lending online aren’t new alternative fads or models, they’re the norm, as they were born as digital natives. According to research from Deloitte , being self-employed as an entrepreneur is a key role model for millennials. In developed countries: 54% of millennials started or plan to start their own business, and 27% are self-employed. And their investment interests are likely to reflect this worldview. Because they’re young, they have the long time horizons and higher risk tolerance that startup investing demands. And having witnessed several market meltdowns coincide with the rise of thousands of successful startups, millennials don’t see private company investing as more risky. Moreover, the line between what is a public and private company is thinning. Ecosystem elements — the rise of incubators, increased liquidity through exchanges like SharesPost, equity crowdfunding sites , and legislative reform like the JOBS Act – have made, and will continue to make, investments in startups easier as well. And since the unicorns that all investors want a piece of are staying private longer and eschewing the public route altogether, the only way to participate in their growth is to invest in them as private companies. In most eras, and in most industries, massive change occurs at a measured pace that is more gradual than most prognosticators predict. For the world of investing, though, the stage is set for a convergence of technology, legislation, and the predilections of America’s largest generation to reshape investing norms quickly. I’m passionate about the change that is coming as the traditional practice of investing is being democratized and made more accessible.